iRealHousewives | The 411 On American + International Real Housewives: Ramona Singer’s Ex-Husband Mario Is Looking For Love On Dating App Bumble! 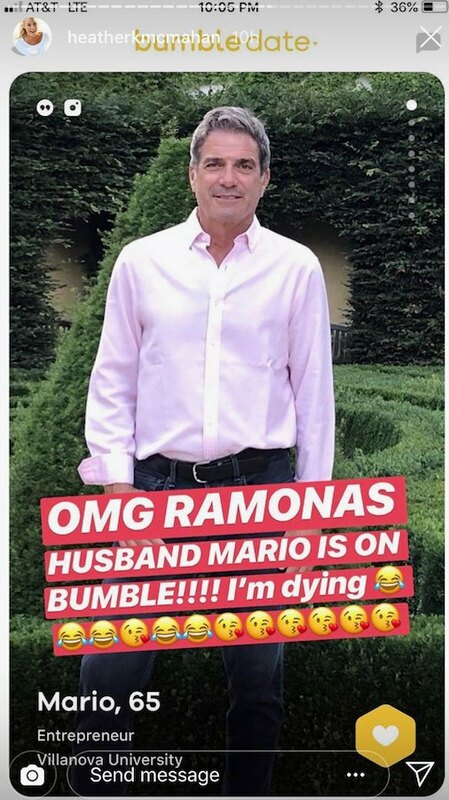 Ramona Singer’s ex-husband Mario is back on the market and is looking for love on the dating app Bumble. Comedian Heather McMahan posted the former Real Housewives of New York City star’s profile. Mario is wearing a light pink button-down shirt and jeans in his dating app photo. He describes himself as a 65-year-old entrepreneur who attended Villanova University. As previously reported, Mario’s split from girlfriend Kasey Dexter, who he had an affair with while married to his wife of 27 years. Ramona filed for divorce from him in January 2014. Mario dated Kasey until their split in January 2018. He hit her with an eviction notice on January 26, 2018 after he allegedly caught her cheating on him via a video footage from a hidden camera in their Florida home. The case is still open, according to Radar Online.